But… there was a rumor, a whisper, after the Fall. Joshua placed a long-distance call, and God picked up. Similar to Dean's Amulet, Joshua's amulet was forged by the angel soon after the Fall as a means to communicate with God. Rumor among the angels was that Joshua used it once to contact God, and was answered. However, according to Methuselah, God never actually answered Joshua. The amulet was left behind with Methuselah, lost within the clutter of his shop, Orlando's Emporium, when Joshua returned to Heaven. 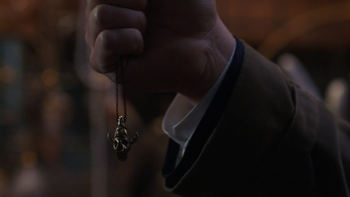 While the shape of the amulet is similar to Dean's, Joshua's amulet has a more skull-like appearance. Seeking a way to restore Jack Kline's soul, Castiel seeks out Methuselah, who was present when Joshua made the call that God supposedly answered. Methuselah only tells Castiel and Anael that they will know what Joshua used when they see it, and that the item is somewhere in his crowded shop. Just as Castiel gives up, he spots the amulet and realizes that it's what Joshua used, as it is similar to Dean's Amulet which glows hot in the presence of God. Methuselah confirms that Joshua created it when he fell, but like Joshua, Castiel gets no answer when he tries to use it to communicate with God. This page was last edited on 23 April 2019, at 07:14.